Ireland is a country that is famous for drinking, but like everywhere else in the world, Cannabis Nation has a toehold in the Emerald Isle. While one may not expect to find marijuana reformers and activists in Ireland, it seems that no matter where you go in the world someone wants to end prohibition and Ireland is no different. While Irish culture may differ from that of the US or even England, the marijuana laws are similar, and there are marijuana reformers in Ireland with the same goals and solutions to prohibition that we have here in the States. Under the Misuse of Drugs Act of 1977 and 1984, marijuana is considered an illegal substance in Ireland. However, the Irish police, An Garda Siochana, distinguish between possession for personal use and possession for sale or supply. Possession of cannabis or cannabis resin is treated less severely than other drugs. The punishment for the first and second conviction of cannabis possession is a fine and after the third conviction, a fine and up to three years in prison. The penalties for possession or trafficking of hard drugs are stiffer. According to the 2002/2003 Drug Prevalence Survey, cannabis is the most widely used illegal drug in Ireland, followed by magic mushrooms and Ecstasy. Twenty-four per cent of young adults (age 15-34) and 11.4% of older adults (age 35-64) have used cannabis in their lifetime. The lifetime use figure for adults is 17.4%, while 90.2% have used alcohol and 60.1% have used tobacco. With numbers like these and the traditional fondness for alcohol, Ireland would seem to be a prime spot to try and push a cannabis-alcohol equalization agenda -- and now some people are doing just that. The Centre for Cannabis Policy Reform (CCPR) is the first cannabis policy reform organization in Ireland. While in some other countries, marijuana reform efforts have been going on for decades, they are relatively new in Eire. Prior to the founding of CCPR, Irish reformers gathered in online groups, but they say they hope to create more "official" groups in the near future. CCPR has identified three main issues within the broader topic of cannabis as key organizing points: cannabis-alcohol equalization, regulation not prohibition, and cannabis as a medicine. On the marijuana-alcohol front, CCPR is working with the American reform group SAFER, based in Colorado. SAFER executive director Steve Fox told the Chronicle: "SAFER supports the efforts of CCPR to bring our 'marijuana is safer than alcohol' message to Ireland. We believe it is a message that will resonate across the globe, especially in places where alcohol consumption is high. Once the people realize that marijuana is a safer recreational alternative, we are certain that support for marijuana prohibition will crumble. We wish CCPR the best in its efforts to educate the public and change marijuana laws in Ireland." On May 6, CCPR presented a legislative proposal, the Cannabis-Alcohol Equalization Initiative, to the Irish government. "We believe, as is the mainstream scientific opinion on the matter, that because cannabis is demonstrably safer than alcohol, both on the individual and on the community level, that it should be given the same legal status as alcohol; that it be taxed and regulated by the state authorities, being acknowledged as a safer recreational alternative," the group explained. Since March, almost 100,000 people have heard CCPR's radio spots, and the group has also garnered print media coverage around Ireland. But CCPR's main audience is online and they say their site doing extremely well. The group has a huge propaganda campaign planned for the elections in 2007 and is determined to make cannabis an election issue. There are political parties supporting legalization in Ireland, but most of those in favor are hesitant to vocalize their support. For example, Sinn Fein and the Greens, left-of-center parties, rarely mention cannabis. CCPR will be targeting these parties, encouraging them to speak up. CCPR's cannabis/alcohol equalization initiative may educate some politicians who weren't aware of the facts, and hopefully over the coming months the Initiative will be discussed in detail. While CCPR does not actively campaign for the legalization of other drugs, the group concedes that regulation is the rational approach to all drugs and not just cannabis. While the group hopes to see marijuana downgraded as it was in the United Kingdom, CCPR sees it main task now as building up public support for the end of prohibition in Ireland. Kiel Nelson, the cofounder of CCPR had this to say: "We need to get the support of the majority of Irish people, which may be easier than it sounds," said Kiel Nelson, CCPR cofounder. "Everyone acknowledges that prohibition is a failure, for example, and that alternatives need to be explored. And with increased awareness of the facts of cannabis, for example its medical qualities, or that it is safer than alcohol, people will inevitably begin to seek change from their government. Plus, we have the truth on our side, which is all we need." CCPR isn't the only game in town for marijuana reform supporters. As in around 200 cities across the planet, Dublin was the scene of a Global Marijuana March on May 6. 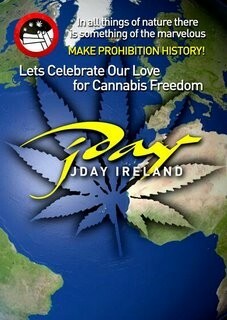 Known in Ireland as J-Day, the event was organized by the Cannabis Ireland Alliance (CIA). The group worked for months to prepare for the global event, and while crowds were small, one must start somewhere. The marijuana law reform movement has reached Ireland. Now it is time to see if the movement can move the lawmakers.